Astrolocality is becoming an increasingly complex yet always fascinating part of astrology. It exploded when Jim Lewis popularized it back in the late 1970's and early 1980's. It was called Astrocartography then, and Jim used mundo rather than zodiacal lines. 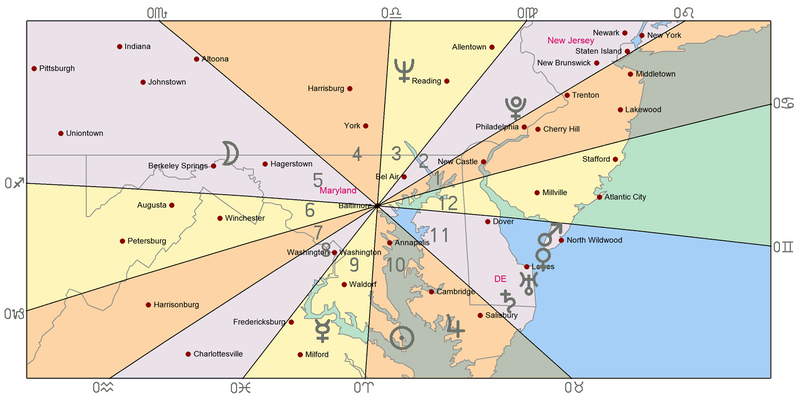 With the rise of computers in the 1980's and 1990's, more accurate or varied maps were possible, as well as software dedicated soley to locational astrology. Then came Local Space Astrology, which was developed by Michael Erlewine back in the 1970's, but which did not really catch on until much later. It is still today not used as much as basic astrolocality, perhaps because it is less well understood, but its potential is enormous and its use is mind-boggling. It's also known as the Horizon System because what it basically does is flatten out all the planets onto the horizon plane as seen from the native's time and place of birth, and establishes direct geographicallines to or beyond them. 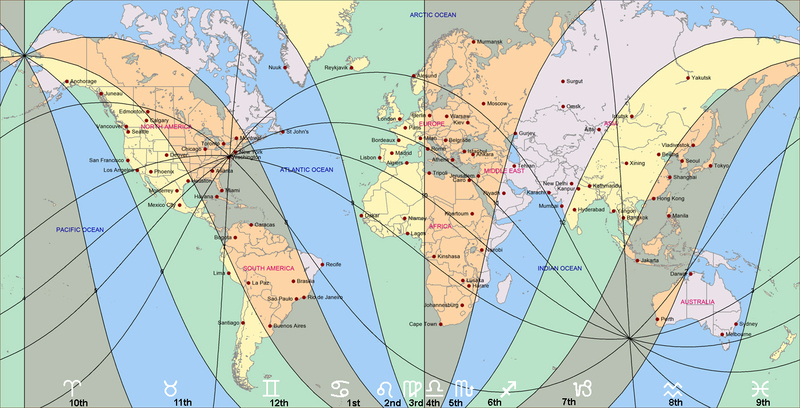 While Local space lines can run across the entire plane or globe, they are most accurate and powerful and useful closer to the individual's actual location, hence the name "local" space. Local Space "centralizes" a person's planetary energies, much in the manner of Feng Shui. This is not possible with basic astrolocality and is the missing key to it. Here is how I use both. Note: The Whole Sign House system is recommended. First make a Whole sign Ascendant map of the world for your time and place of birth. It is not necessary to enter the planet lines at this point. Then overlay it with your whole sign Local Space sign/houses, also without the planet lines. It should look something like the following, which is a world map for someone with Cancer rising born in Baltimore Maryland. I have colored in the main locality signs/houses for aesthetic reasons. This shows how the World Ascendants are spread out at the time of the native's birth. Overlapping that is the web-like Local Space grid starting from the native's birth town or city and ending at a point directly opposite it. The details are left out for claity. Let's zoom up the map to show the native's more immediate surroundings. This is where Local Space Astrology shines. This second map shows the Local Space Signs and Houses within the basic Astrolocality framework, and this even without the planet lines! In local space, the 1st house normally faces east and the 4th house north. Also, the 1st-7th house axis is narrowest while the 4th-10th house axis is widest. The main 1st House/Ascendant(Cancer) influence(orange-colored) dominates here, with the local space signs/houses as sub-influences. The local space 1st house area is where Cancer is felt the strongest. The second is a Cancer-Leo influence, and so on. If the native moves to another nearby town or city then recalculate the chart from there using the same birth time. This relocated chart, however, is secondary in influence to the chart for one's birth place. The more time one spends in a different location the stronger the relocated influence becomes. Even in this map, the city of Baltimore is not obvious, so we shall zoom in even farther. Below is the maximum zoom for my software which clearly shows Baltimore and its surrounding towns and cities. Here, the Local Space Map starts to become more personal. 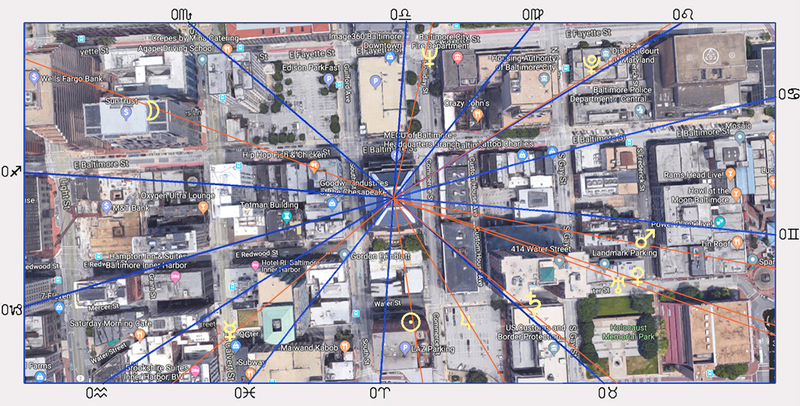 To zoom up further would require a Google map of the city and a transparent overlay of the Local Space Map(which can be done through Paint or Photoshop). Compass alignment is automatic and the center of the wheel is positioned over native's residence. To protect the native's privacy, I have chosen a random building in Baltimore's downtown area. You can clearly see the Local Space Signs/Houses and planet lines here. While planets affect the entire house/sign area, they are strongest along their specific line of trajectory. Going further, even the interior of the building could be analyzed with the Local Space technique, but this would require a floor plan. Now you can understand why Local Space Astrology is so powerful -it brings locational astrology down to a personal and practical level. In fact, everywhere you go, or move can have a Local Space Chart drawn up, so long as it is properly aligned to the compass points(East for the Ascendant).